Anytime Ping launch a new range of clubs, the greater golfing public tends to tunes in. Ping's loyal followers and Tour players were introduced to the company's new G30 range last week and whilst Angel Cabrera was using his new G30 to win the Greenbrier Classic, I was in Germany at the global launch of the new range. Whilst on the range, I got a chance to chat with Ping's Director of Product Development, Marty Jertson, about the new range and what the average golfer can expect from the clubs. It's been a couple of years since you have moved on from the successful G25 range. A lot of companies are making their lead times shorter but you've waited and stuck to your normal schedule. Can you explain a little about that and the timeline of making G30? Yeah, our product lifecycle is designed to come out with meaningful performance gains every year and we certainly want certainly want to maintain our loyal customer base and not introduce product too quickly after they have just bought their previous clubs. That's why we're proud now to introduce a lot of new technology, a lot of substantial improvements from G25 to G30 with this line. Talking about technology, there's a lot of technology in the G30 range. Let's start with the driver. The main talking point is the "Turbulators" that Ping have introduced on the crown. Can you explain exactly what they are and how they help? The Turbulators are a lot of fun. We've been researching these for a couple of years and we're excited to bring them to market here in the G30. What the Turbulators do is normally on the downswing, when the air would flow over the face, it would normally detach and create a wake on the on the back of the driver that would act like a vacuum and slow the driver down. What the Turbulators do is act like a trip-step, creating an air flow stream that stays more attached to the crown. Just like everyone has seen a video of a car in a wind tunnel with really good aerodynamics, that's really what happens with the Turbulators. They reduce the drag, get rid of that wake and allow you to swing the club faster, which turns into more ballspeed and more distance. Will we see players like Bubba Watson, with higher swing speeds, experience more gains because they swing faster? Yeah, exactly. Bubba, swinging as fast as he does, got over 2mph more clubhead speed and around 10 yards further with the G30. The everyday golfer is going to get a least three quarters of a mile an hour more clubhead speed going from G25 to G30. And that's without having to make the clubhead any smaller or sacrificing the stability or anything else that's good about a larger head driver design. One of the great things about the G25 driver was the CG position. It created a really good balance of forgiveness and distance. How much of a challenge was it to improve upon that and offer something new? It wasn't easy to do. The G25 CG was really low and really far back giving a high launch, low spin flight with a ton of forgiveness and stability. The key for us was is keep moving the CG low and back on a diagonal. If you move the CG position back but not low enough, you start to produce too much spin. We were able to move it back and lower though and the primary reason is that we are using a new face material called T9S. The "9" stands for the percent of aluminium it has, so we have a little more of that which is lighter and also stronger. So with the new face we were able to make the face thinner and save weight to allow us to move the CG lower and further back. With CG, we all know it's about finding the right launch and spin and you guys have improved the options with more adjustability? Yeah, the previous adjustable hosel has three settings and you could adjust loft by half a degree. We worked really hard to create our Trajectory Tuning+ so now you can adjust the loft by plus or minus one full degree as well as setting in between with is 0.6 degrees, so now the G30 has five positions and a two-degree range of loft adjustability. Well that's the exciting thing about it. We were able to increased the range of adjustability without increase the hosel diameter or the mass of the sleeve itself. We kept the sleeve sleek and lightweight, which doesn't have any negative affect on the CG or the aerodynamics. Now as well as the standard G30 driver, you guys are offering a SF Tec, or straight flight, model. How does that driver differ from the standard model? Yeah, we're really excited about the SF Tec and think it could be a great option for a lot of golfers. The whole back weight design of the SF Tec is shifted to the heel side. That moves the CG nearer to the heel, a lot like our K15 driver which was very popular for golfers who tend to leave the ball out to the right. This SF Tec works in much the same way. It's going to create a clubhead that is a little more closed to the path and from the impact itself, it's going to impact the spin axis. What we've seen is the SF Tec is a great fitting option as it changes the shot bend on the ball flight by about 12 to 13 yards. Ok, so it's designed to keep the ball flight straight without having as much offset as some draw-bias drivers? Exactly. It doesn't have any more offset to it than the standard model. It still sits relatively square. We think its a beautiful looking driver. And it's offered in more loft than the standard model? Yes, the SF Tec is available in 10 or 12 degrees and has the same, improved adjustability as the standard G30. More on through the G30 family, you have the G30 fairway and hybrid. Now the G30 fairway has Turbulators like the driver, do they work in the same way? Not quite. As clubheads get smaller in size, the projected surface area is lessened so they are naturally a lot more aerodynamic to begin with. Also, golfers tend to swing them a little slower because they are a little shorter in length than a driver. We do still have the Turbulators and they do help a little bit with aerodynamics but their main intent on the fairway wood is to help with alignment. Even on the driver, the Turbulators really help capture the ball and focus your eye so they make the clubs a lot easier to line up. Now this is the first G-series fairway wood with adjustability. Can you touch upon why it took Ping until now to offer that and explain how it works in the fairway? We think launch conditions and getting your ball flight tuned for distance is really important, especially in drivers and fairway woods. With hybrids and irons, the focus is more on distance gapping and control. We've been working a long time on the adjustability in the fairway wood, making sure the hosel design and sleeve are really lightweight and we wouldn't have to make any negative sacrifices within the clubhead. Ok, and last but not least is the hybrids. We spoke about the importance of shape in a hybrid and the evolution of what the everyday golfer likes to see in a hybrid club. Can you talk about the look of the hybrid and the technology behind it? Yeah, shape in hybrids is really important. I wouldn't call the shape of the G30 hybrid iron-style but it is hedged a little in that direction from the G25. So what does that mean? It means the hosel axis has shifted a little more forward. That helps capture the ball a little more and create more dynamic loft. Then the face shape of the hybrid is a little more rectangular. It has a little more low heel and low toe on the face as well as more high toe and high heel. That makes the face a little more boxy if you like, which is more like an iron, and helps players square up easier in the address position as well as creating more impact area for shots off the heel and toe. Now the question we get asked a lot is "which golfer is this range aimed towards?". Do you see this still being a mid-to-high handicap range? Where does it sit compared to the G25 and i25 ranges? I would say it's much like the G25 family which a little step towards the i25. So it's perhaps coming down the handicap range a little? Yeah, I'd say. Mostly because of the shape. The whole range looks sleek, lightweight and compact but still has max forgiveness. For the higher handicappers, especially in the hybrids, we have some larger designs in our Karsten series. The G-series for us is our ultimate range. If we were going to make one range to fit as many golfers as possible, it would be the G-range. Will you be putting one of these options into the bag? Adult technology comes to junior clubs with free upgrade. 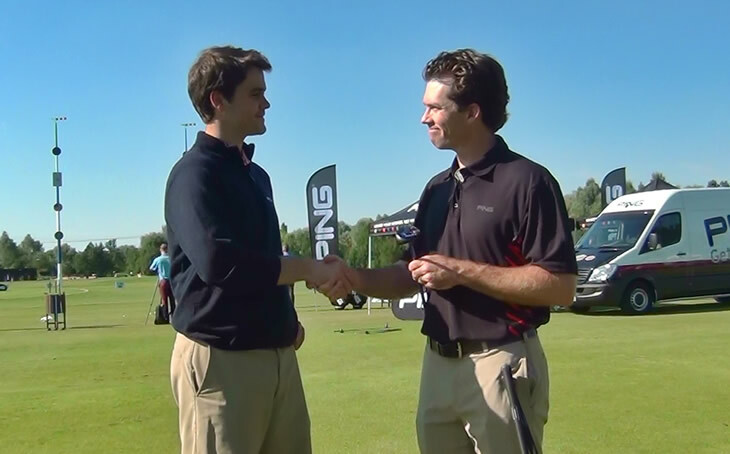 Jertson gives us the Max details on G400 driver, G700 irons. Bigger is better as Ping Max out the G400 driver.